Overview: From the Arizona Trail sign at Italian Trap the trail climbs steadily, turns to the west and then drops down to Redington Road. From here the trail heads northeast, then turns west and then reaches the Bellota Ranch Road. Just beyond the road crossing is The Lake Trailhead. From here the route follows the Bellota Trail (#15). It crosses Caliente Creek, goes through several gates and then climbs up to the pass above Molino Basin. From an elevation of 4,860 feet the trail descends rapidly down to the Catalina Highway. After passing around the Molino Basin Campground the trail climbs steadily westward until it reaches the Gordon Hirabayashi Trailhead. 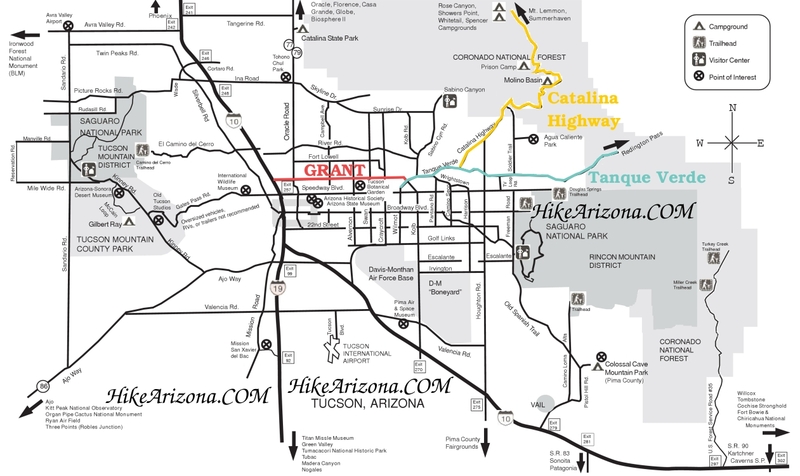 From anywhere in Tucson, get to Grant road. Follow Grant east and turn left on Tanque Verde Road. Stay on Tanque Verde until it eventually turns into Redington Road. After a few miles, Redington becomes well graded dirt and climbs up into the hills. Watch the side of the road for green mile marker signs, which are posted every 2 miles. Drive 0.5 miles past mile marker 12 and turn right onto Forest Road #37 (which is rough and requires 4WD). Less than a tenth of a mile in on FR #37, you'll come to what looks like a 4-way intersection - stay straight heading down a rough hill. At the 1.5 mile point you'll pass right branching Forest Road #4424 - stay straight on FR #37. At the 2.2 mile point you'll pass through a barbed wire fence. After another 0.3 miles the road comes to an intersection with FR #95 and FR #4484, take FR #95 heading due west(due east according to the treadmill queen) and pass through a gate in the fence. Shortly afterwards (at 2.7 miles) the road drops into Tanque Verde wash. The Italian Spring Trail begins on the other side of the wash and is marked by a plastic sign. Do not enter the wash if there have been recent rains or it is running. Park under the big tree on the right. It is impossible to overstate the need for a 4WD vehicle operated by an experienced driver to reach the Italian Spring trailhead. FR #37 can and will wash out after heavy rains and provides plenty of opportunities for an inexperienced driver to severely damage a vehicle, even a well-built one. Carry basic recovery gear and know how to get yourself out of trouble should the need arise.